Many thanks to Kev Walshaw for providing this clipping. Leeds City were formed in 1904 and included Herbert Chapman (later to find fame at Arsenal) among their managers. 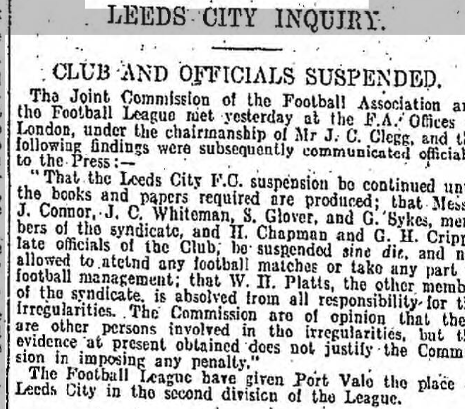 In 1919 they were found guilty of paying players during World War One. An especially harsh punishment was handed down mostly because of the behaviour of the club’s directors, who refused to co-operate in an FA inquiry, and refused to hand over the club’s financial records. Port Vale (who had been out of the league since 1907 when their finances had caused them to resign and move into non-league football) took over their remaining fixtures (as well as their results up to that point). 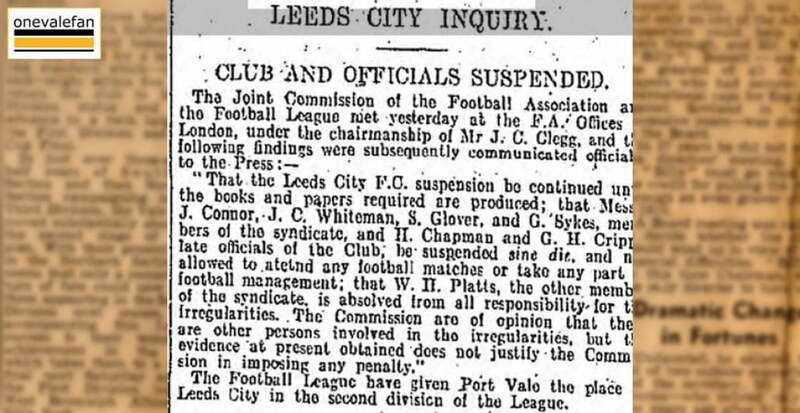 Leeds City remain the only club to be expelled from the League mid-season, and the only ones to be expelled from the League due to financial irregularities (ironically enough Port Vale nearly lost their League status for similar reasons in 1968, although they ultimately managed to retain it in an end-of-season vote among the other clubs). On 17 October 1919, an auction was held at the Metropole Hotel in Leeds, where the playing staff was auctioned off along with other assets of the club. The 16 members of the playing squad were bought by nine different clubs for a total of £9,250.